Attached to the fans by two single straps, the rehabilitation mister installs in seconds. Very low maintenance due to its very robust design and materials used. With its very fine mist, the rehabilitation mister is perfect to facilitate the physical recovery of the responders after fire operations. In addition, it allows learners' training sessions to be extended by keeping them cool. Discover BATFAN 2, the most versatile LEADER battery-powered fan on the market: PPV, extraction, blowing, misting, foam generator, etc. 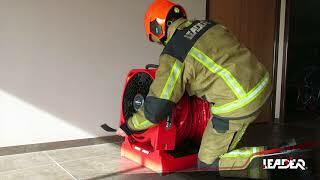 Lightweight, portable and autonomous (battery-powered), it allows great operational flexibility for firefighters.